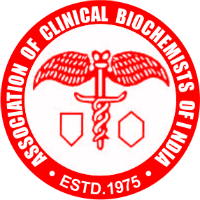 Association of Clinical Biochemists of India. A two days’ conference followed in which Executive Committee members were elected and Professor Awadhesh Saran was installed as its First President. At the behest of the Association, the Medical Council of India recommended separation of Biochemistry Subject and the Department of Biochemistry from those of Physiology. Separate paper of Biochemistry was introduced at the 1st M.B.B.S. examination from 1977. In 1978 it was resolved to start Quality Control programme to bring about improvement in laboratory services and a committee was constituted under Chairmanship of Dr. A.S. Kana gasabapathy. Dr. Kanagasabapathy started the programme in 1978 from his department at C.M.C. Hospital, Vellore. Since then he has been sending Q.C. samples every month and gives a feed back to the participating laboratories. He started with only a dozen participating laboratories and today more than 1200 laboratories are participating in this programme. Dr. Kanagasabapathy received great help from his colleague, Dr. S. Swaminathan. This programme has brought about remarkable improvement in performance of laboratories. The cooperation given by C.M.C. authorities is highly appreciable. After Dr. Kanagasabapathy retired, Dr. S. Selvakumar of the same Department is continuing the programme. The Association started publishing News Bulletin containing Association news twice annually since 1980 and quarterly from 1998. An official scientific publication, started coming out from 1990 under the Editorship of Dr. T.N. Pattabiraman. He gave a sound foundation for the Journal. Since then the Journal is serving as medium to publish work of our members as well as of others also. It is published four times in a year (January, April, July and October). Members felt the need for accreditation of clinical laboratories in order to provide quality result to patient's investigations and an Accreditation Committee was formed under the convenorship of Dr. U. Satyanarayana in 1994 to frame rules and guidelines for voluntary accreditation. was founded in 1979 at a meeting of some National societies of Asia Pacific region including ACBI held in Singapore. India became a founder member of the Federation. The 9th APFCB Congress was held in Delhi in March 2002. India was invited to join IFCC (International Federation of Clinical Chemistry) in 1988 and after fulfilling the required criteria ACBI joined the IFCC in 1990. Since then our members have taken keen interest in the activities of the IFCC and APFCB.